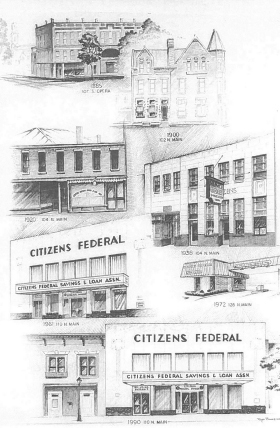 It was on February 13, 1885 that a small group of individuals met to finalize plans for the organization of The Citizens Building & Loan Company that would later be known as CITIZENS FEDERAL SAVINGS & LOAN ASSOCIATION. At the next meeting on March 18, 1885, a local businessman and Civil War hero, Captain T. L. Hutchins, was elected the first President of the Association. It was also agreed to pay half the monthly rent of $4.50 to share office space at 107 South Opera Street. The primary focus of the association was to provide Logan County residents with assistance when they wanted to buy, build and repair their homes. Around 1900, CITIZENS FEDERAL moved to 102 North Main Street where space was rented in the back of the Bellefontaine National Bank building. In 1919, the building next door was purchased and they moved into their new home at 104 North Main Street. It was an exciting time in the mid 1930s when commitment and dedication to serve the community’s needs were the basis for success and continued growth. Further remodeling and expansion in the early 1960s brought about another change of address to the current 110 North Main Street. In 1972, in order to provide faster and more convenient service, a new drive-thru facility, which also allowed for walk-up customers, was built at 126 North Main Street. The drive-thru was connected to the main office via a TV monitor. A vacuum-sealed tube system enabled transfer of documents to and from the main office. A facelift and expansion into adjacent buildings in 1990 changed the appearance of our main facility. The loan department was enlarged during this expansion. In 2002, adjacent property north of the drive-thru was purchased and a new expanded drive-thru facility was built. The new drive-thru building offers four traffic lanes, an ATM machine and a night drop to better serve our customers. The newest remodeling phase for the 110 North Main Street location took place in the fall of 2005, making better use of the space we had for each of the different departments. Over the years, we have grown in the number of staff and the services we provide, but you can be sure that the service Logan County residents have grown to expect and depend on for 130 years has not changed. 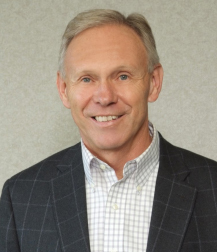 Our founders would be pleased to know that we continue to provide a safe and profitable way for local residents to save their money and finance their homes. We continue to be locally owned, locally managed and locally controlled. We look forward to the future and take pride in the part we have played in Logan County’s growth. We appreciate your support as we continue to help you with all your financial needs – checking accounts, mortgage loans, savings and time deposit accounts, individual retirement accounts and online banking. You can count on us – yesterday, today and tomorrow! Thank you Citizens Federal Savings & Loan for your years of service to our community and for your long standing support of the Chamber.